The fitness of a genetic trait (an allele) may vary over time, rather than remain constant. 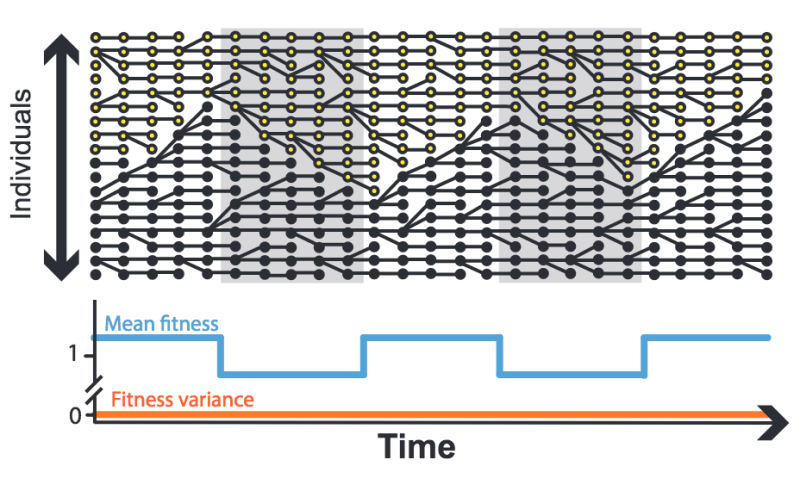 In this simple model, populations with two different alleles (black or yellow) see-saw between advantage and disadvantage as their relative fitness changes over time (blue line below). Credit: Weinreich et. al. The phrase "survival of the fittest" makes the principle of evolution by natural selection easy to understand—individuals with a trait that adapts them well to their circumstances are more likely to pass that trait along. But as a new study explains, multiple factors make predicting the fate of a trait fiendishly difficult. Not only would improved predictive models help scientists better model how evolution works, but also they could aid in efforts to prevent infectious diseases. Every year, for example, vaccine makers, epidemiologists and physicians strive to predict where diseases such as influenza, Zika, HIV and Ebola may be headed next. Fundamentally, the problem is that a trait conveyed by a gene variant, or allele, may be advantageous for one or a few generations, but provide no advantage or become a liability when circumstances change, said senior author Daniel Weinreich, a professor of ecology and evolutionary biology at Brown University. But most theoretical models of population genetics assume that fitness remains constant. "We are articulating a number of different biological contexts in which the fitness of an allele might change over its 'lifetime' or lineage" in a population," Weinreich said. "We are convinced that the other contexts, where it is constant, are the exceptions, not the rule." The new study in the Annual Review of Ecology, Evolution and Systematics provides an overview of what complicates predictive models and how scientists are trying to make progress, for the benefit of public health, among other areas. "Infectious diseases experience constantly varying selective pressures as they spread within and between hosts and encounter drugs and host immune responses," said lead author Christopher Graves, who earned his Ph.D. from Brown and is now a researcher at Bayer. "Understanding how evolution proceeds in scenarios of highly variable selective pressures will increase our ability to predict drug resistance and disease outbreaks and ultimately lead to the creation and deployment of more clever drug and vaccine strategies." Perhaps the most obvious way that the fitness of a trait can vary is that the environment can change, not only over time but also over space. Consider the population of a species of weed in a vacant lot. Some might carry an allele that helps them thrive in a hot sun and others might have an allele that conveys a relative advantage in cool shade. Not only could weather patterns change dramatically over timescales ranging from days to years, but also new buildings might go up or get torn down around the lot, creating new patches of shade or sun. A model projecting the fate of each allele becomes much more complicated along multiple dimensions. Another dimension that can vary is the "social" life of alleles. Alleles that result in "cheating" are abundant in nature, but they are most effective when they are rare. Once everyone is cheating, it might no longer be an advantage, so the trait over time can become a victim of its own success. Moreover, genetic predispositions to cooperation doesn't just roll over. The paper cites cases in which "policing" behaviors have evolved, such as insects that preserve the supremacy of the queen by destroying the "selfishly" laid eggs of mere workers, or genes that produce a tumor-suppressing immune capacity to destroy cancer cells because they are growing too fast. Conditions can even vary within a lineage because one allele might emerge that affects another. Weinreich has studied this in the emergence of antibiotic resistance in bacteria. He found that four mutations of a particular enzyme sometimes increased drug resistance and sometimes didn't, depending on what other mutations were present or absent. That any of these circumstances can change over time adds yet another layer of complexity, Weinreich said, because the rate at which circumstances change matters. When circumstances change faster than the organism's rate of reproduction—for instance sunny or cloudy weather patterns that come and go over a few days—the sun- or shade-loving weeds each experience only minor influences on their reproductive success. But if circumstances vary more slowly—for instance a large new building shades the entire lot for decades—the sunny allele carriers could vanish from the lot and the shady allele will fully displace the other type. In this case, the sun-loving weeds may have gone extinct by the time the building is torn down again. Indeed, Weinreich said, many models for predicting the fate of alleles have overlooked the possibility that traits can go completely extinct. Meanwhile, the rate of environmental change is very similar to the rate at which natural selection acts, the math becomes especially tricky. In their search for solutions, population geneticists have employed new approaches, Weinreich and Graves wrote. Among the most exciting, Weinreich said, are those in which they join forces with and borrow techniques from ecology and epidemiology—two fields in which modeling dynamic and complex change is central. This summer, for example, has featured a workshop, "Eco-Evolutionary Dynamics in Nature and the Lab" at the University of California at Santa Barbara's Kavli Institute for Theoretical Physics, that is dedicated to exploring such intersections. Weinreich said he plans to delve deeper into the complexities of changes in fitness deriving from varying rates of change in social (e.g. cheaters), genetic (e.g. competing alleles) or environmental (e.g., weather) parameters. "The overlap between ecological and evolutionary processes—that those two things speak to each other very intimately in a way that's been overlooked in many models—is the way forward," Weinreich said. "That's what's needed to make critical improvements to models."